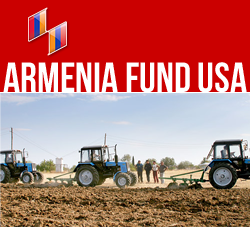 Yerevan, June 29, 2015 — Today, on June 29, the Hayastan All-Armenian Fund unveiled the refurbished, six-kilometer irrigation pipeline of Kirants, a village in Armenia’s Tavush Region. The reconstruction of the pipeline, known as the Sranots line, was made possible by the fund’s Argentinean affiliate, through the financial support of benefactor Krikor Simsiroglu who attended the ceremony with other Argentinean-Armenian benefactors. Kirants, a border village, has a population of 365. The community is engaged mainly in growing grains and tobacco. According to the mayor, Kirants is among a handful of Armenian villages with a growing population, even surpassing pre-independence figures. “Thanks to the refurbished irrigation pipeline, now we can cultivate 120 hectares of land instead of 20,” Hmayak Nazaryan, Kirants village mayor said. “This is an enormous improvement, one which will significantly boost local agriculture and household incomes.” During the opening ceremony the mayor conferred Honorary Citizenship of Kirants on benefactor Krikor Simsiroglu. Currently another important development project, the construction of greenhouses, is being implemented in Kirants, also with the financial support of the Hayastan All-Armenian Fund’s Argentinean affiliate. In 2014, the fund’s French affiliate established a farm in Kirants and provided local farmers with purebred heifers, seedlings, and saplings. Since the beginning of 2015, the Hayastan All-Armenian Fund has unveiled a string of completed projects in Armenia and Artsakh. They include the newly built community centers of the villages of Patara, Khantsk, Khachmach, and Shosh, all in Artsakh’s Askeran Region; Karin Tak community center in Shushi region; the newly built kindergarten of Sasunik, in Armenia’s Aragatsotn Region; and a newly built indoor therapy pool at the Children’s Home of Gyumri, in the Shirak Region. Another completed project that is slated to be unveiled soon is the extensively renovated school of the village of Khachardzan, in Armenia’s Tavush Region.